Join us at Margaritas Mexican Restaurant, 180 Center Street, Auburn, ME on Thursday, August 28 from 4:00 pm to 10:00 pm. 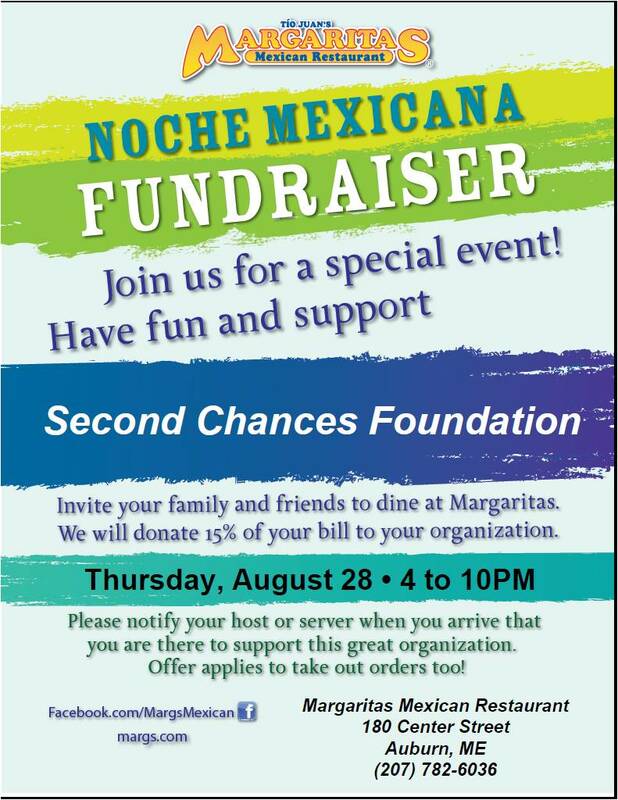 Margaritas will host a Noche Mexicana Fundraiser and donate 15% of pre-taxed food and beverage sales from participating families, friends and supporters to the Second Chances Foundation! Guests can choose items from any of their menus, takeout orders included. Call Ahead Seating (207) 782-6036. We encourage students, parents and community members to join us as we raise funds to support Aimee. Please share this event with friends, family and community members! Print out the attached handbill and be sure to bring it with you. We will have extras with us that night in the event that you forget yours. If you have questions about this event, please contact Joanne Pineau at media@aimeescause.org or (207) 624-1043. Please make sure to let the host or server know that you are there to support the fundraiser, so 15% of your pre-tax food and beverage purchases will be donated to the Second Chances Foundation!